Does Your Central Heating Need Power Flushing? Together with my plumbing and central heating repairs, I also provide a power flushing service in Nottingham and Derby. 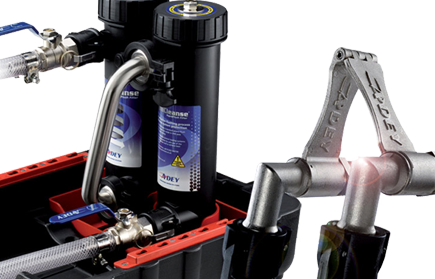 Used in conjunction with the "Adey Magnaclean" magnetic filter, my power flushing service can help restore the operational efficiency of our central heating system. If your central heating boiler emits strange noises, or if your radiators fail to heat your home and only become "lukewarm" at best, your central heating may benefit from this treatment. Suitable for all types of domestic heating systems, power flushing not only extends the operational life of your central heating, it also increases efficiency and subsequently lowers energy bills whilst reducing carbon emissions. 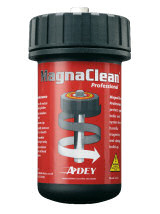 Fitting the Adey Magnaclean filter to your system will virtually remove 100% of all suspended black iron oxide that causes harm to your heating system on a continuous basis. This cleansing process, combined with the filter, delivers ongoing protection against the damaging effects of black iron oxide sludge, and non-magnetic debris for all residential central heating systems. This form of power flushing is the most economical method around, as it uses much less water than the standard power flushing service, saving you money and leaving you with a cleansed central heating system.